How to Fix Error 0xF1 on Epson Printers? 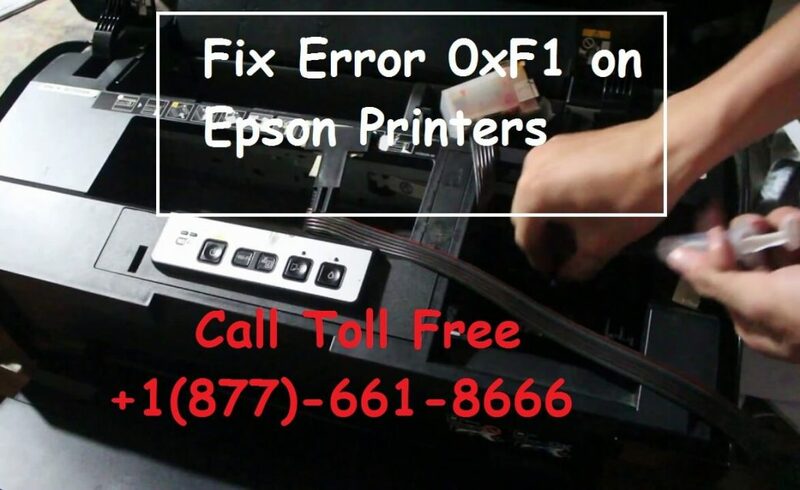 Blog » How to Fix Error 0xF1 on Epson Printers? Epson printers fulfill all your printing requirements and needs efficiently. The print quality offered by Epson is higher than the ordinary printers. The working of the printers is easy, and you can operate them with the snap of your finger. However, the printings sometimes get hampered due to errors like 0xf1, 0x69 and 000031. You might be wondering on what does the error code stands for? What to do with these errors? How can these errors be resolved? How can I resume the printing as before? 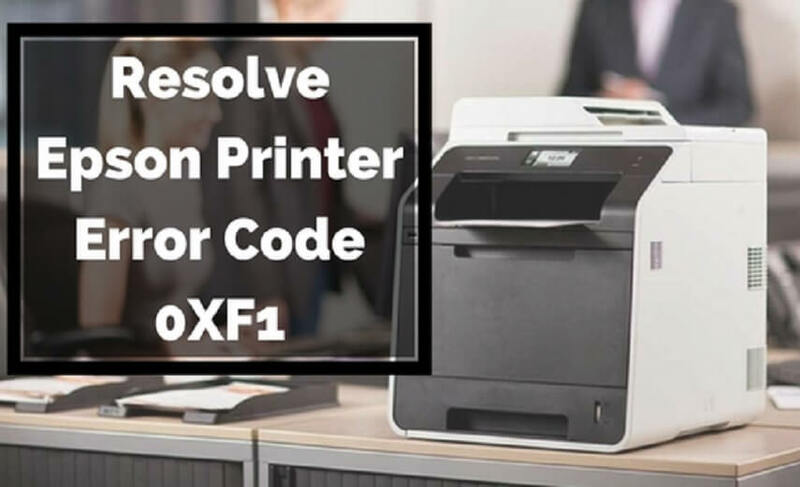 In this post, we will be discussing on How to Fix Error 0xF1 on Epson Printers? To resolve the issue with Epson Printer, you first need to check the cause of the error as knowing the cause of the error will help in resolving the issue in a better way. This article enlists the cause of the 0xf1 error and some of the probable fixes to the issue. Though you might not find much of the information about the error, this article can help you in getting the issue fixed and get your printer back to working again. However, fortunately, the error can be resolved in a better way. We have listed five feasible solutions for the error code 0xf1. The most common reason for the error to occur is a paper jam in the tray. To resolve the error remove any paper jammed in the printer. So, check to see if there is any paper inside the paper tray. If you can’t find any paper jammed, it is possible that there is a small piece of paper stuck inside the printer. Look carefully and try to remove any piece of paper stuck in it. There is no piece of paper jammed in the printer, and still, you can’t access your printer? Proceed to the next tips. As said by many users, the error 0xf1 is not very informative, and the same error code is used by the Epson to define some critical issues. So, the solution cannot be found exactly, and hence you need to hit and try all the possible solutions for this problem. The next solution is to reset the printer settings to factory restore. This magical solution works as a cure for many problems in almost every electronic device. The same can also work for your printer too. Reset the printer setting to restore all the settings to its original system state. This reset all the settings to default and resolve any issue related to the software of the printer. Another way to resolve the issue can sound weird, but it has resolved the issue for many of the users. As per the experiences shared by the users online, wiggling the printer head can resolve the problem of 0xf1 error. As sometimes the head can get jammed because of overworking or not working at all. You can see some videos available on YouTube to check how to clean the printer head. If none of the above-provided solutions worked for your printer, try using the printer troubleshooting as discussed below. For some models of the Epson printer, the printer displayed a problem message as “Printer Error, Turn power off and on again. Error code 0xf1.” However, the issue was not solved even after turning the printer off and on several times. The printer was still not functioning. This issue might be because the printing command is given from a wireless device. This might be a little strange that this advanced device got non-functional just because it was used to get a print from a wireless device. As suggested by Microsoft support, you should try running printer troubleshooting. Running the troubleshooting will quickly diagnose the error and clear it, if possible. If nothing works, Re-installing the printer software can also resolve the issue. There could be a virus or malware that could be the reason for all the trouble. Re-installing the printer software might help you in getting rid of the virus or malware. You can watch a video on YouTube to see how to uninstall, download and install the printer software. 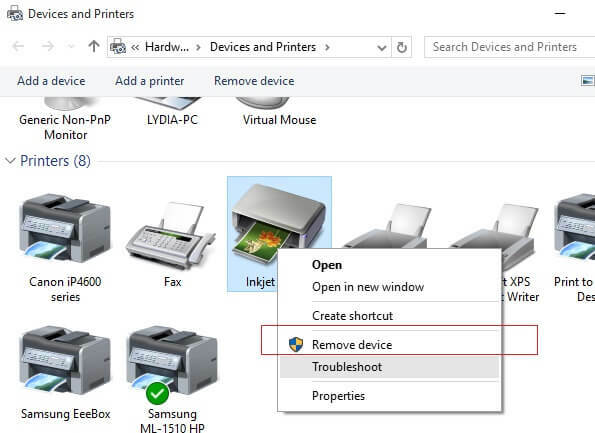 To uninstall the printer software, navigate to the programs and features option in the control panel and look for the printer software installed. To uninstall the printer software, double-click and un-installation will start. After completing the un-installation, navigate to Driver and printers option in the control panel of your windows and select remove device. After this, restart your computer and then install the printer software. If you do not have the printer software, you can go to the official website of Epson and download it. Install the printer software again. Hopefully, the solutions discussed above can resolve any issue related to connection, software, paper jam, or virus. Following these, you can use your printer like before and Fix Error 0xF1 on Epson Printers. If you are still unable to find the solution to this error, you can contact our customer support service for Epson Printers via any of the available media from email, support website, or toll-free number (+1(877)-661-8666). You will be able to get the best possible solution to resolve the problem and able to print again successfully. How to Update Epson Printer Driver?